This is a book. 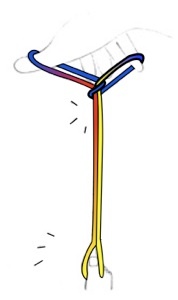 In it is a flag which changes colour and a girl who has lost her necklace. Here it is! 1. 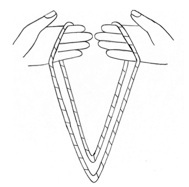 Hold loop as a book as shown. Open and close hands as if opening a book. 2. Pass right hand string to left. 3&4. 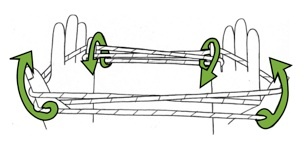 Place the four fingers of your right hand towards you through both hanging loops. 5. 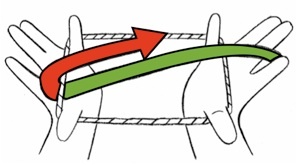 Close both hands and pull apart to make the flag. 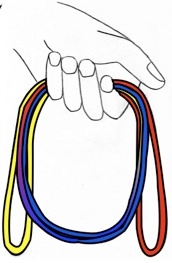 6.Turn the right hand and the colours change. 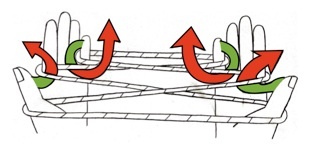 Bring hands together as you make this turn and the trick may not be noticed. 7&8. Again pass the right strings to the left. 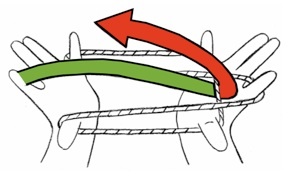 Hold strings with left hand to make the girl. 9&10. Right hand joins left to show the girl better. 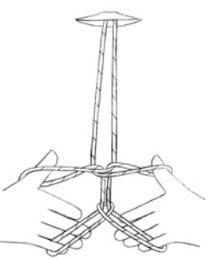 Hold strings lightly and then pull hands apart to show the necklace. In 1902 Walter E Roth published drawings of the finished patterns of seventy-four figures collected from the people of North Queensland, Australia. The drawings were re-printed in Caroline Furness Jayne’s ‘String Figures and How to Make Them’. One of them, ‘Roth’s Plate V111 No. 8’, shows a Palm-tree with a man (made by the big toe!) hiding below. For a string story of a Palm Tree and a man who gets hit on the head by a falling coconut follow the instructions below. Once on a beach a palm tree grew. It grew and grew. It even grew a huge coconut. One day a man walked up to the tree, “I’m going to climb up and get that coconut. But not yet.” He sat down under the tree and fell asleep. While he was sleeping wind made the tree sway. “Ouch!” The coconut fell on the man’s head! 3. This is ‘Opening A’. 4. 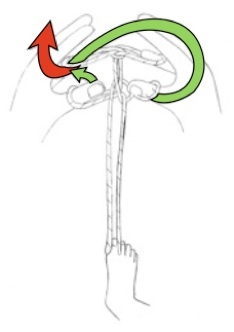 Thumbs and little fingers enter and widen the index loops from below. 5. 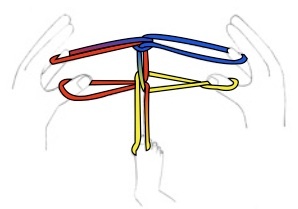 Lower thumb string is lifted over upper and off from the near side. 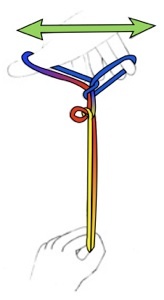 Lower little finger string is lifted over upper and off from the far side. 6. 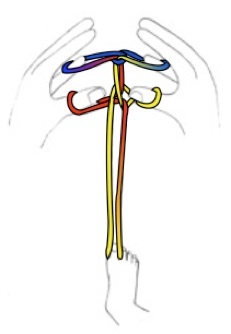 Mouth lifts near transverse string. 7. Release index fingers. 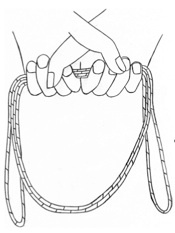 Mouth drops string which is held instead between the knees (make figure while sitting). 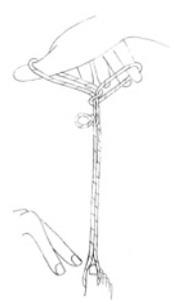 The drawings show the base of the figure being held in traditional way by the big toe. 9. Bring hands together and the Palm Tree seems to grow taller (the branches get shorter). 10. Release right thumb. Right thumb then takes and removes left little finger loop from the tip side. Palm Tree seems to grow even taller. 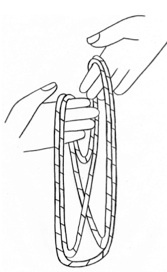 Point left thumb away to twist thumb loop. 11. Release left thumb for ‘coconut’. ‘Walk’ left index and middle fingers towards ‘palm tree’. This is the ‘man’. 12. Left hand holds base to show ‘man sitting next to tree’. Right hand sways to show ‘tree moving in the wind’.